Super strong construction. By choosing the best materials, we've designed our adjustable strut rods to be the strongest after-market struts you can buy. Extensively tested on the street and racetrack. Built in steering stop on all models replaces stock piece. Machined wrench flats on each end of tubes for easy adjustment. CNC machined frame ends and 5/16ths thick laser cut LCA adapter brackets. The stock rubber bushings have been replaced with a high quality, high strength chromoly rod end mounted in a custom designed billet steel bracket. This eliminates the stock bushings and binding problems associated with the stock strut, while allowing free movement throughout the suspensions range of motion. All steel parts are finished with the highest quality black powder coat for ultimate long-term weather protection! No cutting, welding or modification needed for installation. 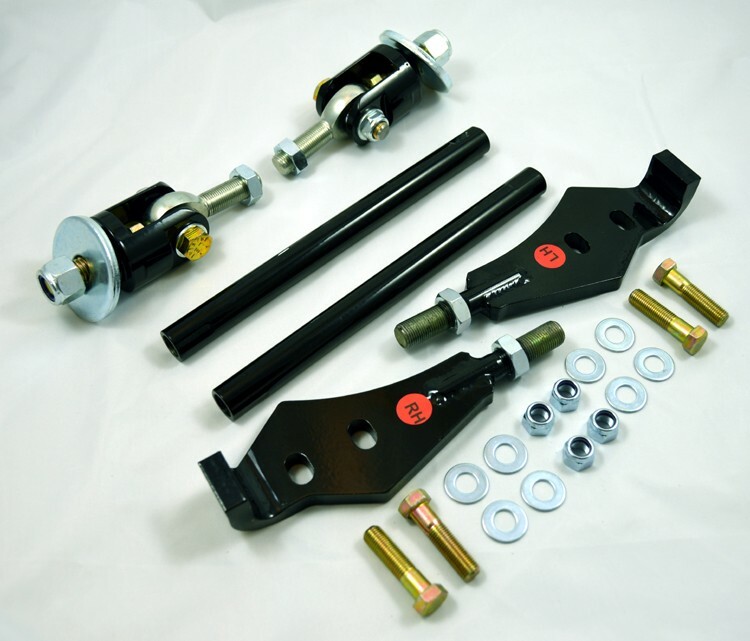 With basic tools our adjustable strut rods can be installed in approx. 30 minutes per side. Alignment needed afterwards. Kit supplied with detailed instructions, quality fasteners, nylon insert lock nuts and all the hardware you'll need to install our kit! STSR65-66 fits 1960-65 Comet, 1964-65 Cyclone, 1960-65 Falcon, 1964-66 Mustang & 1960-65 Ranchero. STSR67 fits 1966-67 Comet, 1967 Cougar, 1966-67 Cyclone, 1966-67 Fairlane, 1966-67 Falcon, 1967 Mustang & 1966-67 Ranchero. STSR68-73 fits 1971-77 Comet, 1968-73 Cougar, 1968-71 Cyclone, 1968-71 Fairlane, 1968-70 Falcon, 1970-77 Maverick, 1968-71 Montego, 1968-73 Mustang, 1968-71 Ranchero & 1968-71 Torino. Click on the below image to watch a YouTube video of stock Moog replacement bushings. 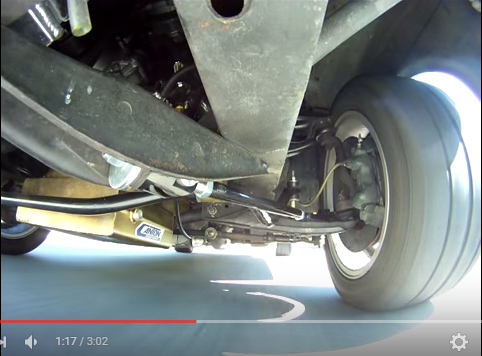 Watch how much they compress and stretch during normal driving at slow speeds. 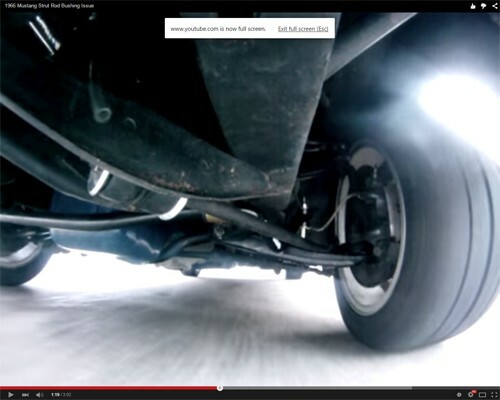 This deflection results in the lower ball joint and steering arm moving around while driving. This in turn alters the caster and toe resulting in a twitchy car that wanders all over the road. The fix used to be to install polyurethane bushings. This stopped the rod compressing and stretching but didn't allow the rod to pivot at the frame when the suspension cycles up and down. The result is stress on the rod right at the threads which can eventually result in it snapping! The fix is to install our Adjustable Strut Rods. Not only do they eliminate the compression and stretching issues of the stock rod, they also allow the suspension to cycle up and down freely. Oh, and the tube is left hand and right had threaded to allow for easy caster adjustment. 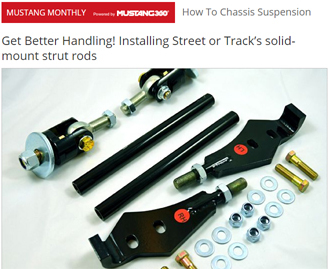 Click on the below image to watch the same car AFTER installation of our Adjustable Strut Rods. Notice how smooth the suspension cycles up and down with no change in strut rod length. This results in a much more stable car that drives straighter and won't dart all over the road under braking. 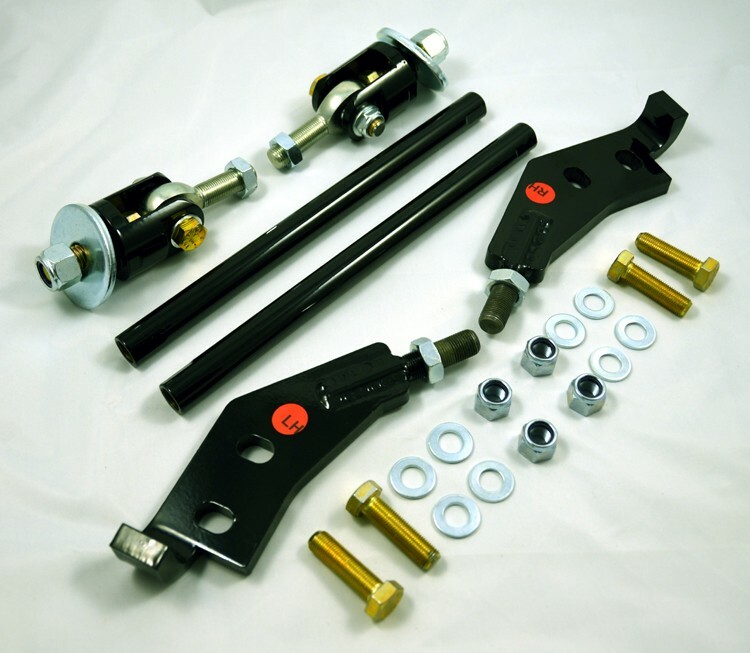 The ability of these strut rods to move in conjunction with the control arms allows the arm to move more freely. I noticed an immediate improvement soon after installation; enough so that I just purchased my second set! I had the stock strut rods with poly bushings prior to installing these Adjustable rods on my '67. 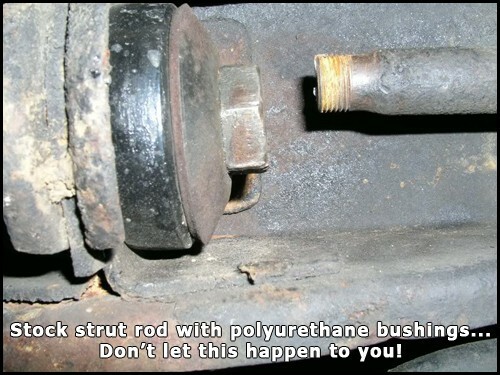 I was always afraid that I would snap a strut rod (I drive the car on the street as well as at Open Track events and there have been many reports of the poly snapping). There was an immediate improvement in handling (the suspension really does move more freely with these), but that wasn't the biggest surprise. I had expected the ride to be harsher, but it was actually just the opposite: the poly bushings transmitted every little bump to the steering wheel, but that went away with these adjustable strut rods. I drive my car in open track events mostly and have been very pleased with these strut rods. The braking stability at speed is greatly improved, and it's much easier to feel the corner entry and exit and where the car wants to go. Just received the control arms and strut rods. I wanted to say these parts look amazing and the quality is top notch. Nice work on these and I can't wait to get them on and try it all out. Thanks again for the outstanding customer service. The strut rods are in and all I can say is wow, completely different feel. You should have seen the stock bushings when they came out, they were brand new but already shot. So much so that I told you under braking it was listing the car to the left there was so much slop. Now I feel no slop and I can mash the brakes hard and I feel way more confident to actually stopping. It is one of those things that you really don't even understand how bad it drives until you put those in and feel what it is supposed to be like. One of the best improvements you can make on a classic Ford. The ride is much smoother, the handling is better and installation is a breeze. 5 years, 3 open track events, and lots of miles on the road, the strut rods have handled all the punishment I could dish out to them. A truly excellent product. I just wanted to let you know i recieved the strutrods. They look great!! I'm very happy with them. I just took my '72 for a drive, what a difference the struts make!! the front end feels so much better, more responsive, more ... "feel" i love it!! The strut rods installed easily and sure made my caster adjustments a lot faster! Thanks for the good service. The strut rods worked out great, no more darting under hard braking. I also noticed my corner entry and exit speeds picked up. Overall, the car was more stable and predictable at speed. The other guys I run with at Barber noticed it too. Glad to see a company building a quality product right here in the USA. Keep it up! I’ll be in touch with you later on, with some of the other items you offer. I now have the new SoT strut rods installed. I'm really impressed by the handling of the car. It has improved and I'm very happy with it. When i bought the adjustable strut rods and put them on it helped with straight line stopping, no more rubber bushings flex. What a difference. I bought your strut rods about 5 months ago and put them on right before I put the car in the body shop to have my bent sheet metal repaired from my wild hard braking spin last fall. The improvement is amazing the car stops in a straight line, there is less bumpsteer when driving down a straight bumpy road! Thanks!